Office recruitment are 15 posts. Job Seekers willing to apply for Karauli district recruitment jobs through offline using the official website www.karauli.rajasthan.gov.in. Apply for relevant job and fill the application using the general instructions. Last date to send offline applications with attested copies is on or before 04-December-2017. Applicant must have attain the age between 18 years to 35 years as on 01-01-2017. Collector Office, Karauli Recruitment selection will be based on candidate score obtained in academic Qualification. Monthly salary for the post Jr. Technical Assistants is Rs. 13,000/- and for Accounts Assistant Jobs is Rs. 8000/-. Other information regarding Application form submission dates, Selection Process, Age limits, Pay Scale, Qualification details of Collector Office, Karauli District, Rajasthan Recruitment of Junior Technical Assistant, Accounts Assistant vacancies are mentioned below. 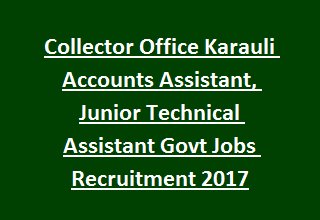 Available vacancies in Collector Office Karauli Recruitment are 15 posts. Accounts Assistant: Applicant must have qualified CA/ ICWA/ C.S (Inter) or B.Com from any recognized University/ Institution. Junior Technical Assistant: Diploma/ Degree qualification in Civil Engineering or B.E/ B. Tech degree in Agricultural Engineering from any recognized university/ Institution. More details regarding education qualifications visit Karauli District Notification. Age of the applicant should be above 18 years and maximum age should be below 35 years as on 01-01-2017. Age relaxations applicable as per govt instructions. Pay Scale for the post Junior Technical Assistant is Rs. 13,000/- per month. Candidates will be selected for Karauli Collector Office Recruitment Jobs on the basis of candidate merit score obtained in academic qualifications. Go through the district notification for selection Process details. Interested/ eligible candidates have to apply for the current vacancies using the Karauli District website www.karauli.rajasthan.gov.in. Read the full instructions to fill the respective application form. Last date for submitting application is 4th December-2017.